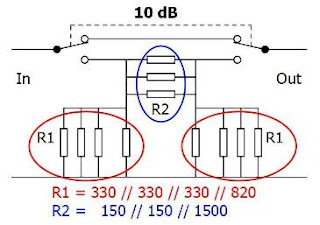 With the attenuator of 10dB my signal is still heard, even though the distances are less. This weekend I was active on 40/30/20 meters with the output of 500mW. 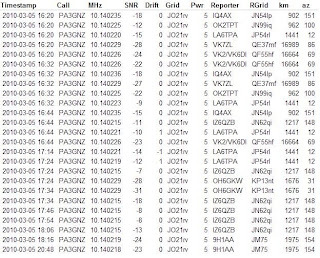 At this moment I am tuned to 40M, see list Picture of activity on 40M. The ideas for creating an attenuator did I found on the webpage of Bert, PA1B. 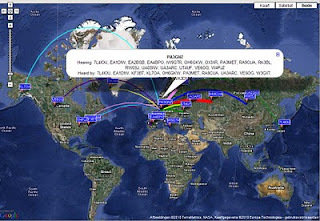 The last 24 hours my system is listening on 20M to WSPR signals. When I'm home the system is also transmitting. At the end of the afternoon and begin of the evening signals from the States en Japan are coming in. In the morning there only a few signals from Europe. Today my transceiver is on 20M to listen WSPR signals. The activity was low, conditions were very bad. In the evening KL7OA heard my signal, longest distance for this day. I have downloaded the latest software for ROS, I wasn't qrv with this mode for serveral weeks. After some European stations have received I have given a CQ. US5UC came back and we could make a "QSO". Via email I received reports from Bulgaria and the USA. Earlier this morning I tried WSPR on 20M. The band was noisy and also a lot of QRM from RTTY stations, a contest is running till UTC 02:00 tomorrow morning. I'm back on 30M with WSPR and there is activity. Today I received the enclosure and knobs for the FT tuthill 80M project. A small nice metal box. From 17:00 UTC I setup my rig to be active with WSPR. On this moment it's running on 30M till tomorrow morning. Sometimes there will be a transmit break when I watch TV. Tomorrow I will be active on 20M. If the propegation is good I will try to make a cw qso. Today the postman posted this new kit in my mailbox, a quick delivery from the States. I new project when my course is done. You can buy this kit on this site. Yahoo users group about this TRX. This week I hardly spend time on the radio hobby. Besides my work, in the evening I am also busy with the “medical terminology” course. Because I only can do in the autumn exam should I just bite through. I hope that there is time to read parts of the new books I bought this weekend. Also no WSPR activity this week. Vandaag met een clubje afgereisd naar Rosmalen. Doorstroom bij de kassa ging vrij snel, ondanks dat de route niet helemaal logisch was. Enige uurtjes langs de kramen gelopen, eerst kon ik mijn boodschappenlijstje niet vinden, uiteindelijk toch onder in mijn jaszak. Bijna alles kunnen kopen: Helaas zijn de weerstanden die als "2 watts weerstanden" aan mij werden verkocht niet geschikt voor dit vermogen, toch een beetje bekocht. Verder wat BC557/BC547 transistoren, een kastje voor de verzwakker, wat draad en 2 boeken. € 2,-- , ziet er ongelezen uit. Today the 2nd Wednesday of the month and that means the monthly meeting here in the neighbourhood where the regional qsl manager is present. Unfortunately, the door was closed and no one had a key to unlock the door. The QSL manager was able to change QSL by his car, after this I drive back home. This time there were a few beautiful QSL’s. 3 with pictures of lighthouses (another hobby of me) and a confirmation of a QSO made with my Rockmite, 300mW, during the OQRP contest in 2008. This afternoon I have build up my station for WSPR to receive and transmit. 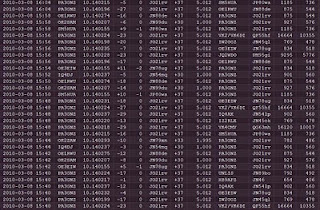 It's on 30M and after some minutes the data rolled over my the screen. Pretty soon I noticed that my signal was heard in Australia. One station from Japan reported also my signal. This is the first time that my WSPR signal is heard in Japan. In the evening I receive not to much cause interference in the reception by TV. Unfortunately my antenna can not be build up outside my apartment. 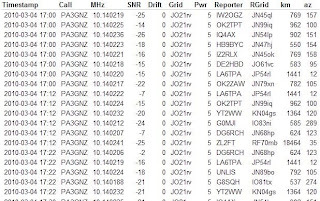 In the last few days my WSPR signal on 30M was received in VK and ZL. Today I came earlier at home and set the WSPR software to transmit. After the first period of almost 2 minutes the first results rolled over my screen. As you can see in the overview my signal is heard by 2 stations in Australia for more periods. Today I set the filter in my FT950 at 850 Hz, this was on 1500Hz before. Yesterday a station from Australia heard my signal, today the distance record is broken. If I'm not at home my laptop/transceiver is only listen to WSPR signals. Via the internet I saw that I've heard the signal of ZL2FT this afternoon for a few times with nice signals. When I came home I put the software in the transmit mode to see what happened. ZL2FT heard my signal 1 period. A new distance record, 18464 km. After the absence of some days I build up my transceiver and antenna for WSPR receive. After a few minutes, my signal is heard by several stations. Great was my surprise when I saw that VK2GR in QF56LG reported my signal, a distance of 16602 km. This my longest distance with WSPR until now. Not bad for 5 watts in a magnetic loop in my apartment.